Looking for a Website Design Company in Great Dunmow or the surrounding areas? 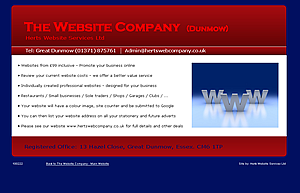 At The Website Company, we provide a website design service to Great Dunmow and the surrounding areas. We are always looking for new ways to offer outstanding value and packages that meet the needs of every type of business. The ability to continually focus on Customer Service has helped our business create many hundreds of websites over the years, and have hundreds of happy customers. We were incorporated as a limited company in 2006 and have a wide variety of customers. From restaurants, plumbers and taxi companies to international freight forwarders, we always follow what our customers want and create websites that serve their businesses needs. Research has shown that most potential customers will look at a website long before they even think about picking up the phone. A website is the most cost effective way to advertise your business services. We believe that websites should be to the point, easy to navigate, load quickly and look modern. All to often, competitors websites are unnecessarily complicated - and unnecessarily expensive.  Hosting: Hosting is a term that many people have heard of these days, but for those that haven't, it is the data centre where the website resides. 24 hours a day, a server is connected to the internet and when someone looks up your website it passes your information to their computer.  Domain Registration: The deal includes domain registration. The domain is the name that you see on an advert and starts with www. we include a .co.uk or a .com domain within the deal.  Photographic Service: We offer a free local photographic service to our customers. For example, we can visit your restaurant or garage and take all the images we need to create your site.  Text Creation: Wherever possible we try and agree the text directly with our customers. However if our customers are too busy to compile the text, we can work at it for you and you can make any final changes.  Email: You can either use your own existing email address within your website or we can arrange email forwarding for you. For example, the email address sales@yourcompany.co.uk can be redirected into your Hotmail account. We can also arrange for your computer to be configured for Outlook so you can send and receive email from an email address like - sales@yourcompany.co.uk A small charge may apply in this situation.  SEO: Your website will be fully optimised for Google and other search engines. We have a Google Webmaster Account and all websites are listed with google.  Google Places: You may have noticed when searching Google that often businesses are listed just below the sponsored links and also a map is displayed. We can list your business in Google places/maps.  Adwords: Adwords is a service run by Google. You may have noticed the term 'Sponsored Links' when using Google. Effectively you can pay a fee per click and buy your way to the top of the first page! We can advise you about this service. We pride ourselves on completing projects within timescales quoted to our clients. You don't have to take our word for it just read what past customers say in our feedback page. Great Dunmow, Bishops Stortford, Stansted, Sawbridgeworth, Harlow, Braintree, Takeley, Newport, Saffron Walden, Hatfield Heath, Great Hallingbury and Thaxted. However, we have also successfully completed numerous remote projects with companies in other areas such as London, working entirely remotely via email, text and phone. New for 2013, again in response to requests from new customers, we have introduced the £95 deal. This is our introductory website and effectively is a templated website, based on the image below. The deal does however include everything, so please see the £95 Deal page. Please see Site Information: page for Legal Information.